Volunteers can, but don’t have to stay for the entire event. Even 1 or 2 hours is extremely helpful. Don’t let being new to beekeeping stop you from volunteering at events. You WILL know more than you think you know and will be able to answer most questions. If not, you have backup. If you are interested in presenting, I highly encourage you to “shadow” someone to see how they conduct a presentation. Several of us have very nice slide presentations we will gladly share. If you want to volunteer, have any questions or concerns, or need to cancel, please contact the Outreach Coordinator. 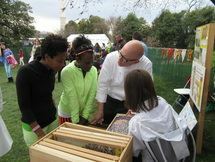 Roer's Zoofari (formerly Reston Zoo) Spring Event is a plastic free and Earth Friendly fun family event with a lady bug release, seed ball activity and a composting red worm and wood lice dig. The event is over two weekends and any level of outreach is appreciated. This is a honey selling opportunity. POC is Vanessa Roer, 703-757 6222. This event is ever increasing in size and scope, attracting almost 2,000 visitors who flock to see "how it was done in the old days." Enjoy the day in an historic cabin camp exploring food, fun and activities. Take home a craft made at the sawmill; listen to music under the canopy of trees; hike with a ranger; shop for gifts at the Eastern National Bookstore; play children’s games. A food truck sells meals and snacks. Bring a picnic basket from home and enjoy lunch at a table in front of the stage. A variety of exhibitors display everything from ancient technologies to vintage vehicles. There’s something for everyone at Heritage Festival! Support Needed: Two volunteers are needed at this event throughout the day. If you have outreach activities to suggest please contact our outreach coordinator at outreach@novabees.org. NVBA is a 501(c)3 non-profit organization.